Two rounds of severe weather are likely in Southern New England today. It does appear as if the first round of thunderstorms will help to limit the potential for the second round. We are still at risk for frequent lightning, damaging wind, large hail and torrential downpours. The tornado threat is small, but not zero. Still if we able to get the sun out all morning/early afternoon there would be a greater chance at a significant twister. The regional radar shows two main areas of showers and thunderstorms. One is moving through Northern New England, the other through NY, PA and heading towards SW New England. Short range guidance is indicating this holds together and impacts Southeastern New England by 12-1 PM. A lot of the action right now is driven by a warm boundary driving northeast into the region. Out ahead of this the sun is breaking out in Worcester County and even from time to time in Andover. This is mainly for round 1 of the thunder. Looking at all the data, the visible satellite, and high resolution guidance I am beginning to believe this may cause the biggest headache for many. The straight line wind damage potential for this is real, especially if it evolves as it enters the unstable atmosphere in Southern New England. We shall see what happens in the next few hours. I will try an update later this PM. 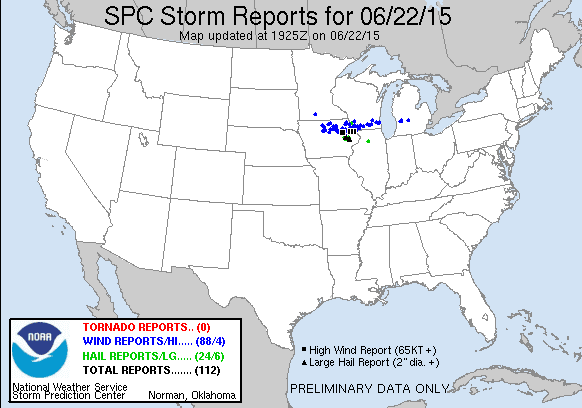 Powerful thunderstorms have left a swath of damage across the Upper Midwest and Great Lakes today. Tomorrow this system will slide east and bring the severe weather threat to New England. Everything is on the table including tornadoes. That said all the ingredients need to come together for widespread severe weather outbreak. A large complex of showers and thunderstorms is speeding through the Great Lakes. This complex has a history of producing wind gusts over 74 MPH. At the surface we see a wave of low pressure and an accompanying warm front forcing its way through Michigan. High temperatures at the same time will surge into the upper 80's. So all we need to do is have some cooling in the middle layers of the atmosphere to make it unstable and allow for the cumulus clouds to tower high up into the atmosphere. Clear skies tomorrow morning/early afternoon will be an indication of whether or not we see a big time severe weather event or just some isolated severe thunderstorms. The SPC has areas north of the Pike, west of 495/395 in an enhanced severe weather risk meaning scattered to widely scattered severe thunderstorms capable of large hail, damaging wind, and isolated tornadoes is likely. That's really all for now. We (meteorologists) need to see what the atmosphere and radar look like tomorrow morning to know for sure. What we do know is that a significant event is possible. Stay weather alert tomorrow. I'll have an update as early as possible tomorrow AM. While we would like to sun the today, leftover clouds from yesterday will help to limit the potential for thunderstorms this afternoon. The big weather story is in Texas where Tropical Storm Bill formed last night and will bring heavy rain and gusty winds to the Central/Northern Texas coast. 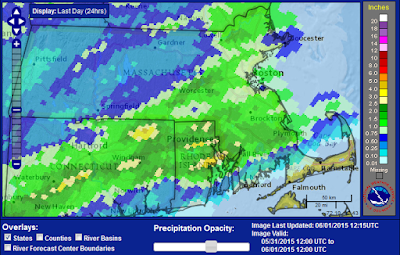 By Sunday the remnants of Bill may bring periods of rain to Southern New England. Until then we see mostly seasonable weather, with a chance of storms Thursday night. By 8 PM tonight the trailing front will have swept offshore. Before this front clears the region high temperatures should rise to around 80. Some showers or weak thunderstorms are possible as the cold front moves through. Lightning is always dangerous but I am not expecting hail or severe wind. 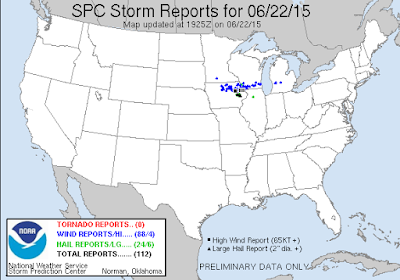 The SPC threat is much less than 2 days ago. The projected track curves the storm north into Oklahoma and then to the northeast into the Ohio Valley. Interestingly enough the storm may hold itself together for awhile as it dumps a swath of heavy rain from Texas to Ohio. Why the storm will hold together is ultimately unclear but there are several theories. The truth is probably a blend of all three. A lot of rain has already fallen in Texas and Oklahoma this spring so the soil is very moist. 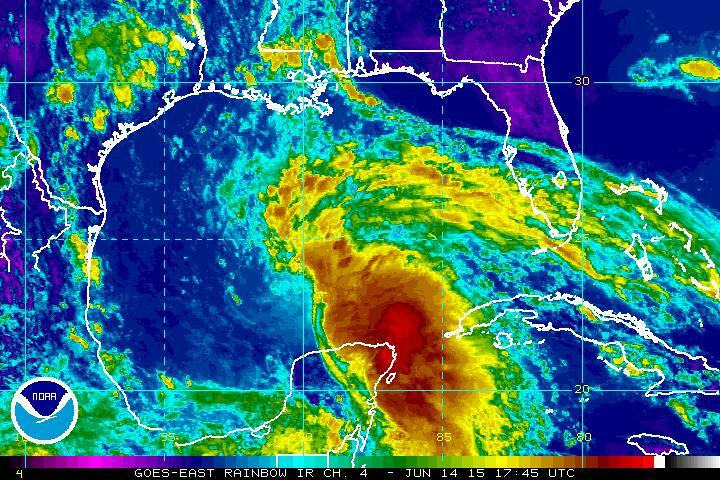 A weak storm like Bill will be able to draw energy from this. See this piece from Dr. Marshall Shepherd. At the same time Bill is getting better organized as it makes it way to the coast so its core is stronger. Also the storm will have favorable upper atmosphere dynamics to work with. Ridges of high pressure will be present on either side of the system. I'm still working out how this will impact New England. My guess is that it will interact with a cold front and we end up with more precipitation on Sunday/Monday than the WPC anticipates at the moment. Maybe some storms Thursday night but the rest of the week looks good, as do Friday/Saturday. Saturday partly cloudy high around 80. After temperatures in the 80s today high pressure will slide offshore and a front will bring welcome rains to the region overnight tonight into tomorrow. Warm temperatures return Tuesday with the threat of thunderstorms, although the greatest potential appears to be in Eastern NY and Western MA/NW CT. As the week progresses a weak tropical system will likely impact the Texas coast. It will be embedded in the jet stream and may enhance precipitation in our region late this weekend. Light rain will break out around 10-11 PM from west to east. Heavy rain will arrive just in time for the lovely Monday morning commute. Anyone who has to use our wonderful interstate system to go to work knows what the combination of Monday, heavy rain, and rush means. Give yourself extra time. Here is the projected surface chart at 8 am. Notice the red warm front to the southwest of New England. High temperatures tomorrow will struggle to reach 60 in a lot of areas. Thankfully this is short lived. 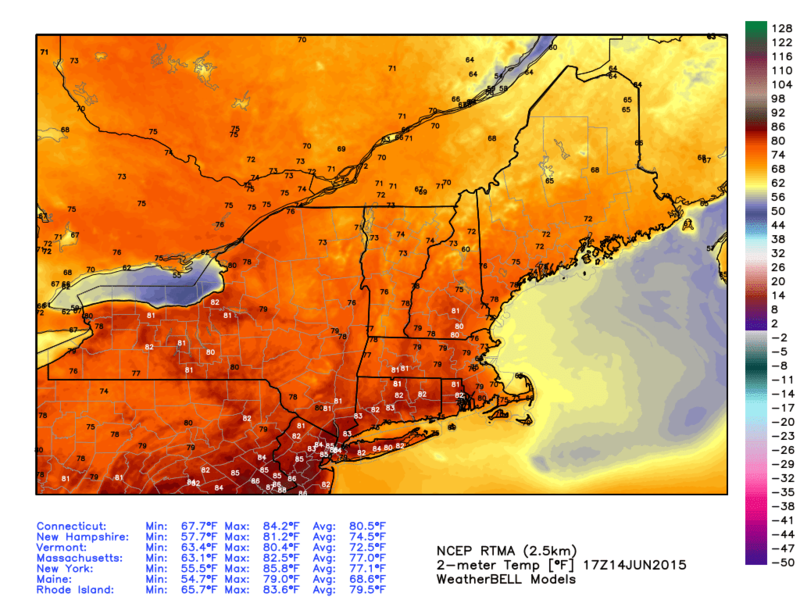 Notice the 90's in Central NJ, 50's in MA! 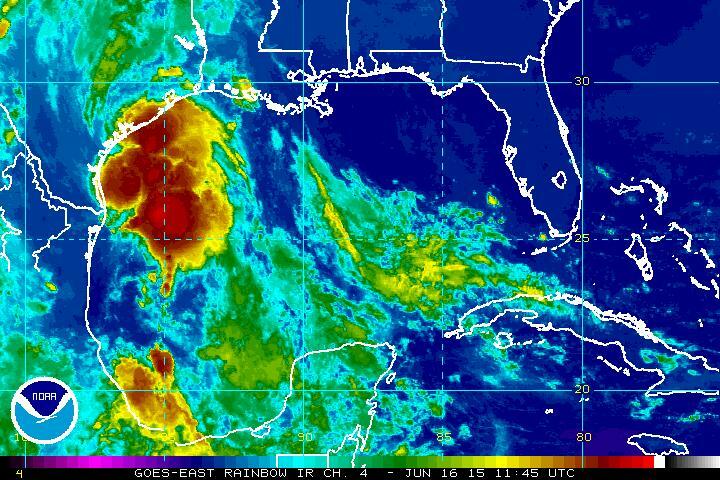 Also notice the low in the Gulf of Mexico. But by Tuesday morning it should be near the Texas coast and should be a little better organized. Rain in Southern New England ends tomorrow late afternoon/evening. The heaviest rain is over early afternoon. 1-2 inches of rain is likely regionwide. Now this is where it gets interesting. The storm prediction center (SPC) suggests a isolated risk of severe weather on Tuesday. I don't buy it for Southern New England except maybe the far western counties of MA and CT. I believe the threat is more PA/NY/NJ. We need it. 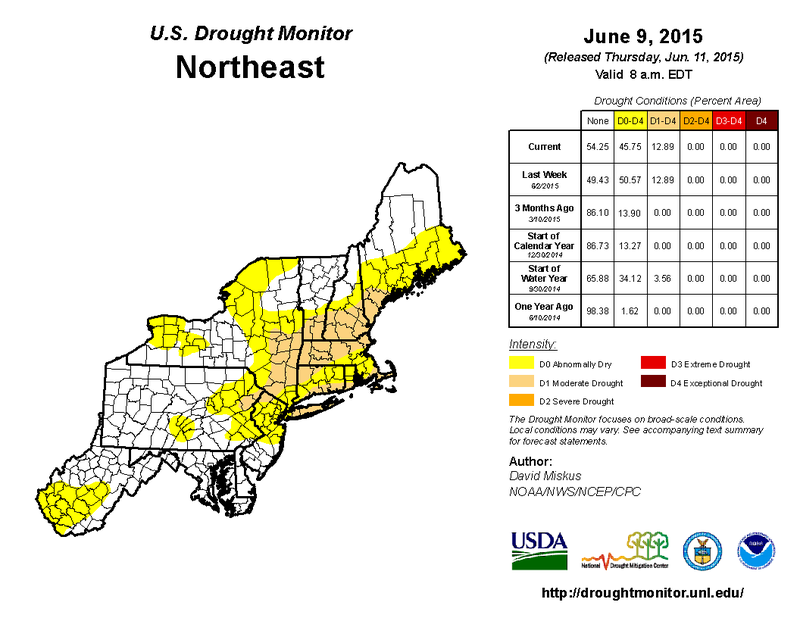 Last weeks rain dented the drought but it did not erase it. Damaging wind and isolated severe hail will be the main threats. Perhaps a micro-burst or two with the warm moist environment that is in place. The best threat looks to be Springfield to Worcester to Nashua, NH north and west. Keep an eye to the sky as it may impact areas like the Blackstone Valley and Merrimack Valley. Boston should be fine. The threat relaxes early this evening (8 PM latest). On this date 62 years ago the worst tornado in New England history ripped through Worcester, MA. 94 people lost their lives. A separate tornado ripped through Sutton, Northbridge, and Mendon. Thankfully the towns were not as densely populated (specifically Northbridge) in 1953 as they are today and no one was killed. I can't see anything like that happening today but we will face the threat of severe weather, especially outside of 495. 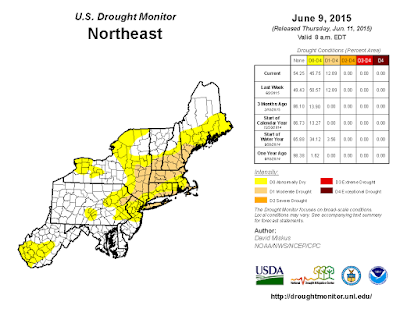 As of 630 there was solid rainfall in upstate New York and parts of Northern New England. Warm and muggy air is present ahead of this cold front heading through Western PA and NY. 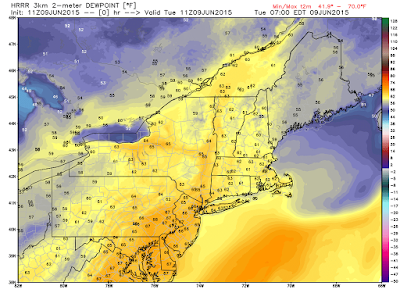 Dew points will rise into the mid 60's as the front approaches this afternoon. Temperatures should rise into the upper 70's and maybe low 80's if we can get some sunshine. If we do get sunshine the threat if severe weather will increase. As of now Northern CT and Western MA face the greatest risk of severe storms. The front will clear tonight leaving temperatures around 80 and dew points in the upper 50's tomorrow. Another threat of thunderstorms exists for Thursday as a another cold front approaches from the Great Lakes. I'll update with any severe weather watches this afternoon. A tornado watch has been issued by the Storm Prediction Center in Norman, OK for Berkshire County in Western Massachusetts and Bennington County in SW Vermont. A surface low pressure system is moving across Ontario with a trailing cold front and a leading warm front. The tornado threat is in between the warm and cold front. Short range, high resolution guidance is showing the potential for a nasty round of storms from Albany towards Pittsfield, MA. These will fall apart as they head east so no worries in Southeastern New England from any severe weather (at least today). Although I believe Western New England has the greatest chance of severe weather tomorrow there could be isolated storms further east. I'll post in the morning with the latest. Even if temperatures like this are more like early April than June 1. Many of us woke up to temperatures in the upper 40's. We are going to do much better as the day goes on. Rounds of rain are expected to move across a stalled frontal boundary to our south. The low in PA is responsible for this mornings round of showers. We should see a let up in the late morning early afternoon hours. The air mass is unstable so isolated showers and thunderstorms will develop but they will not be as widespread. The widespread rainfall threat will resume this evening and into tomorrow. For this reason a Flash Flood Watch is in effect for much of CT and N RI. We are looking at as much as 2-3 additional inches of rain through 8 am tomorrow. This will wipe out the drought in some places (although its certainly possible that it returns later this summer). I did mention the drought could linger through the summer but the short term (1-2 weeks) is looking like above normal precipitation. High temperatures tomorrow will struggle to get out of the 50s. New England weather is funny. Four years ago today we experienced a tornado outbreak that killed 3, including the infamous Springfield tornado that was rated as an EF-3. Here is the National Weather Service event summary. It is a reminder that we can get all types of weather in New England.